Busan vs. Seoul? Hmm... Not sure if you should teach English in Korea in Busan or Seoul? Then this is for you, but I have to tell you that I am biased as I prefer Busan. I lived in Busan for close to three years and visited Seoul a few times. I think Busan is better for the most part, but there are a few things that Seoul is better for. Let's take a look. 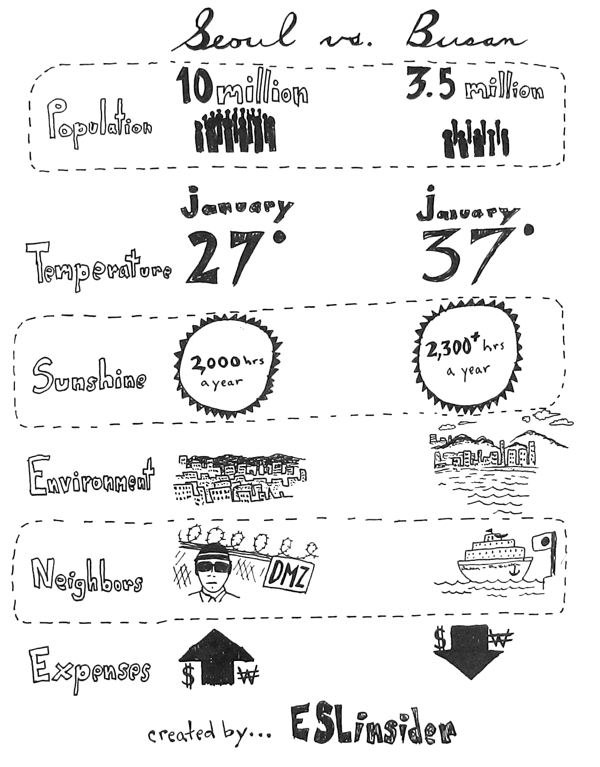 Here's a little drawing I did that compares some of the differences between these two Korean cities. After the picture you will find further details on the differences. Busan is roughly 3.5 million people and Seoul is over 10 million people. Seoul is going to be more crowded. The weather is going to be better in Busan, unless of course you like the cold and the snow. I remember seeing snow flurries fly one time in Busan, but it didn't stick. In Seoul the daily average is about 27 degrees in January and in Busan it's about 37 degrees (taken from Wiki). Even though the winters can be cold in Korea chances are you will have heated floors. Those are really nice. The summers will be hot in both places. You're going to see more sun in Busan as well, approximately 2,327 hours of sunlight a year versus 2,000 in Seoul. Seoul is more sprawling. It is relatively flat with the Han river running through it. There is Namsan mountain with the tower on it and mountains to the east. Busan has several "centers" of the city such as Nampodong, Seomyeon, PNU, Kyungsyung University and Haeundae. It's spread out among the mountains and lies on the coast. One thing I liked about Busan was that pretty much wherever I was in the city I could get to a mountain to hike within a few minutes. Busan has some decent beaches such as Seonjeong, Haeundae, Gwangali and Songdo. Haeundae is the popular one and in the summer time it seems like all of Korea heads here. These are not the best beaches in Asia, but some are pretty good and it's better than what Seoul has to offer. Busan is going to have less pollution. Since it is smaller and sits on the coast the air is cleaner. Seoul sits in a basin and tends to collect more pollution since it is larger. It can get pretty smoggy. People say (even Koreans) that people in Busan are friendlier and more laid back. I never spent enough time in Seoul to say really. I suppose that goes for most big cities anyways. People in big cities tend to be less friendly. A cool thing about Busan is that you can take a hydrofoil to Fukuoka (which is awesome) in like 2.5 hours. Or you can take an overnight ferry which is cheaper. Seoul on the other hand is close to North Korea. The bigger the city you live in the more you're going to pay for expenses. So you are going to pay more in Seoul for rent, food, transportation, etc. and you probably won't make more money teaching or much more money. So where is Seoul better? Compared to Busan Seoul is going to have more variety. You'll find more shopping, bars, nightlife, big bands, English bookstores, restaurants, cafes, galleries, K-POP stars, etc. If you are into the urban thing then this is probably your best bet for variety and options. There are also more foreigners in Seoul. So you will stand out less than you would in a place like say Miryang. If the big city life and a more cosmopolitan lifestyle appeals to you, go for Seoul. I can understand that because at one time I chose to live in Shanghai (24,000,000). If I had to choose again I would still choose Busan as I find it to be a better all around lifestyle. If you are interested in Busan you might like checking out Pusanweb. It's a resource for teachers in Busan. You can find a job there, classifieds, clubs to join and more. If you are still not sure where to teach then this article about choosing the best location for you might help. Here are some things that you will get when you log in to this course. Advice from 26 teachers in Busan, Korea as well as China, Japan and Taiwan on video. How to find your best place (city and country) teaching abroad. A comprehensive look at salaries for teachers in Korea, as well as in Japan, Taiwan and China. And a whole lot more about the actual teaching that includes many how-to videos shot in public schools and hagwons in Korea. The teaching is coming soon... Do you feel confident in your ability to teach? Yes, I want to learn more about teaching in Korea.